We now work with Pau Hana to carry stand up paddle boards! We currently have several Malibu paddle boards in stock for sale. The Malibu SUP Soft Top is the perfect SUP for first time riders looking for a complete package with all the necessary components included (Package includes SUP Board, Adjustable Aluminum Paddle, Single Flexible Fin and Leash). The Malibu sports a padded surface and supple plastic bottom that is resistant to blunt impacts from paddles, rocks and sticks. The fin is tough yet flexible, so that it can bend without breaking and stay on the board even after running aground. 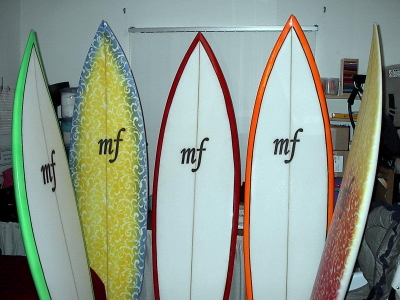 It comes with a standard 10″ fin box that will accept any standard fiberglass fin as well. It has a center mounted carry handle for easy pick up and carry. Because of its durability, it can be dropped and abused longer than an average SUP and still provide reliable use. It is a great board for running down rivers and small rapids, places that may not be suitable for epoxy construction. Who is this board right for: This is a stable board that'll float riders up to 260 pounds. It will provide a positive experience for the first time rider in flat water conditions, but can also be surfed in small and medium sized waves. Performance Characteristics: The round nose, full rails, and flat bottom keep the board buoyant. The width, 30″, promotes lateral stability and resists tilting over. Specifications: Length: 10'8" Width: 30" Thickness: 4 ½"